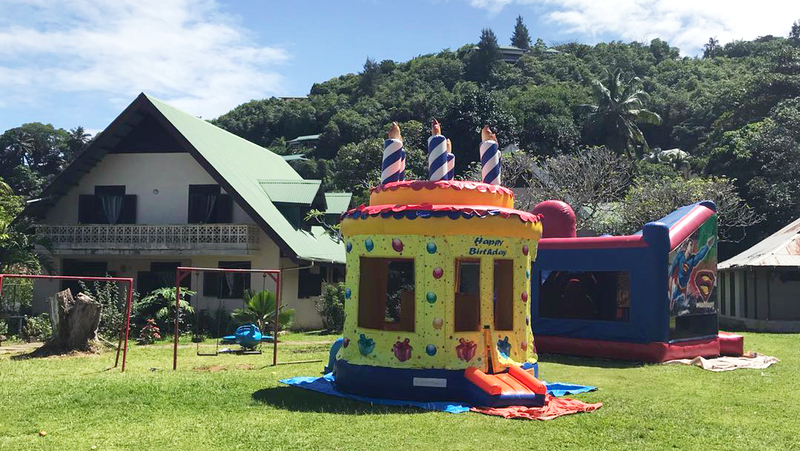 June 2018 – Last Saturday children from the President’s Village Children’s Home in Port Glaud were treated to a festive BBQ lunch, courtesy of Kempinski Seychelles Resort Baie Lazare. A team of volunteers from the luxury hotel visited the facility as part of their ongoing corporate social responsibility initiatives and spent an afternoon entertaining the children and preparing a sumptuous lunch for the home’s residents and staff. The highlight of the afternoon was undoubtedly the two jumping castles that were erected for the children’s entertainment. After all the energy spent jumping on the castles and playing games with the hotel staff, a big appetite was worked up, and a very enthusiastic group of children and staff enjoyed the alfresco BBQ lunch served in the home’s garden. The hotel team donated a gift to each child before they departed, and promised to return again, next year. The President’s Village Children’s Home provides a stable family environment for 40 young residents whose parents are faced with various socio-economic difficulties. Please contact us at pr.seychelles@kempinski.com. Alternatively, you can call us on +248 438 6666.